All year… actually I guess it was shortly after the last craftshow of 2011, I decided I wasn't going to do any shows in 2012… and I didn't. I made beads. And really only made jewelry for challenges, gifts, and my own enjoyment. And I continued to make beads. And more beads. You all never stopped buying! All the application reminder letters just sat on my desk. I figured maybe in a couple years, I'd pick up craftshows again. It really felt great not to have that added stress. And then September came along and I decided on a whim to count up my jewelry and go to the Mountain Magic festival on October 6th. It's a non-juried festival, but I've always done very well there. Even better than at some of the juried festivals I've been to. The one hard thing about it, is that the weather is very unpredictable in October—some years it's warm and sunny, and other years it's freezing cold and cloudy! But one thing that's a guarantee, is the wind—it's always windy. Last year after almost losing the tent in more than one strong gale and having to take it down just a few hours after setup, I decided to not even bother with it this year. Another thing I didn't do were table skirts. Yes, exposed table legs are among the ugliest things at a craftshow, but when the wind catches the tableclothes and brings them up over the table, pulling all the nicely arranged jewelry into one tangled heap, they just had to go too. For my table coverings, I used a stretchy fabric and tied knots at each corner and stretched them over each table and tucked the knots under. Fitted tablecloths on a shoestring—easy peasy! My two "models" are simply wire hangers wearing nice colored tops and scarfs. They really caught a lot of attention and we had to keep resupplying them with new necklaces throughout the day. Here's another shot of them. I bent the hanger back and hung them over a wooden frame, which was taped down to the table. I taped everything that could possibly be caught by the wind! The day had started out on the chilly side, but sunny. Later in the day clouds rolled in and threatened to shower us with rain. They thankfully left without dropping more than just a few raindrops! But the wind had picked up and never left. So eventually, all these earring cards had to be taped down. And my sign caused a near disaster when (yes, I had it weighted at the back) toppled over and hit one of the vases. I turned just in time and caught it before it crashed onto the pavement. I had to put away all the vases by midday—the wind was just too strong and I was afraid they'd blow off the table. The wind continued to get stronger and stronger. And the sun came back out and ROASTED us! Yep, we forgot the sunscreen… actually I didn't even think of it, since we usually have a tent and being roasted is not a problem. By the end of the day, my mom, two sisters, and I were vivid red. So, you're probably asking was it worth it? The cold? The wind? The heat? The sunburn? And oh, yeah, the splitting headache? Yes! Of course I'll make improvements for next time. And also by the time next year comes around I'll probably have mostly forgotten about the uncomfortable parts! I just love getting out and setting up "shop", meeting customers and other artists, and seeing my creations find new homes. I actually got to bring some of my critters too. Most of the time I have none to bring since you all keep them flying out of the shop! (I'm not complaining! lol) But I squeezed in a few this time and everyone LOVED them. Here's one of the owl necklaces I made (please excuse the photo quality and arrangement!). He was too cute not to share! And the very best moment of the whole festival—my favorite clay picture got it's forever home! It was one of those sales, where you know the match between customer and your art was just meant to be! I couldn't be happier about it! 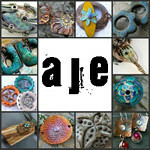 And another note of interest: I'm now part of the Art Jewelry Elements blog! Today I published my first post. Come on by for a visit and to see what it's all about! That clay picture is awesome! I don't remember seeing those listed when I looked at your shop, but that was a while ago. I agree with you, and the memory of the uncomfortable parts being gone by next year. I do 3 markets a week - by the end of 3 months of that I've had enough. But come June I'll be excited like a little kid again. Thanks for the story! What a challenge, that wind! Maybe you could put rubber bands around a board and then slide the back of each earring card over a rubber band so they're removable and still stay on the table. This is why I don't do shows, so kudos for getting out there! Loved your AJE post, too. Your pieces are really fun and pretty. Thanks for sharing your experience! You certainly made the best of a trying environment, Rebekah... your tables looked lovely! I am so impressed by your "hanger" displays... wouldn't that be great mounted on a lazy-susan type of platform (of course, you'd have to nail it down in this particular windy venue LOL). I'm proud of you for getting out there and just doing it! You made the most of your setup and I'm glad you enjoyed it! What a neat set-up you have. I really like your 'models" what a easy and cool idea. Thanks for sharing it. I had no idea you did clay pictures. How did I miss that? So awesome!